State Bank of India is one of the largest Bank in India whose aim is to provide fast, & polite and proactive service to customers. As on 2017, the most trusted company has 209567 employees to offers services for citizens of the country. The SBI PO is the lower management cadre among executives of the company. They are recruited every year to fulfill the future manpower requirements in the public sector bank. The State Bank of India Probationary Officer is a dream job for most of the graduates including engineers. It is a group A post which provides the opportunity to reach even at the Chairman post of the company. And the biggest example for this is the current chairperson of the company Arundhati Bhattacharya who has joined the SBI in 1977 as a PO. The company has issued the latest notification for the SBI PO on 07 Feb 2017 of around 2313 vacancies including the backlog posts in various categories. After the successful appointment in the Probationary Officer grade, the candidate is placed in the scale of Rs. 23700-42020. The basic salary of SBI PO Mentioned in Official Notification is Rs. 23700. But the SBI Probationary Officer gets 04 advance increments of Rs 980 which will be added to the basic. Now the basic that we get in total is Rs. 27620. The Banks DA revises after every 3 months. The current Dearness allowances rate is 45.6%. Like central government HRA scheme or PSU HRA criteria, here in banking sector the rates are slightly different but the classification of cities is same. The HRA rates according to the city are shown in below table. But if a Probationary Officer takes a leased accommodation then there is a separate criteria which also shown in the following table. The benefit of city compensatory allowances depends upon the location of posting. It is paid at the rate of 4% & 3% of basic pay with the ceiling of Rs 870/- & 600/- per month respectively. Government banking sector employees are eligible for special allowances. The newly recruited SBI PO gets the amount equal to 7.75% of basic pay as special allowances. The Probationary Officers are eligible for the provident fund and pension scheme applicable to the state bank employees. The probationary officers of JMG are eligible for the medical benefit of Rs 8000/- per month. 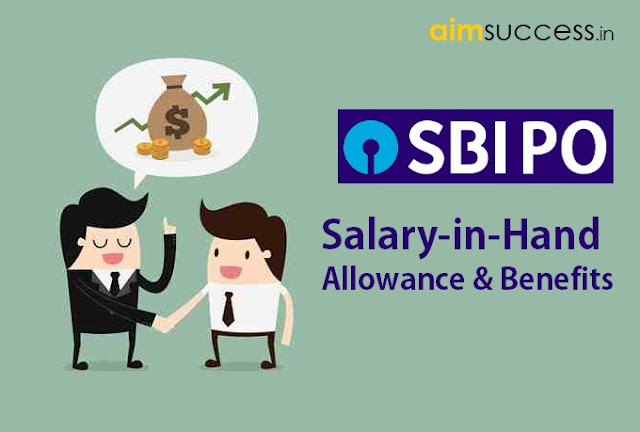 The total compensation for newly recruited SBI Probationary officer would be a minimum of Rs. 7.93 lacs per annum and maximum of Rs 12.95 lacs per annum depending on the place of posting and allowances applicable to him/her. The State Bank of India officers is also eligible for annual increment and promotion which also increases their salary time to time. The pay revisions in banks, is implemented after every 5 years, so the SBI PO will get the benefit of revision of pay in 5 years.